Craftsman Pool by San Francisco Architects & Building Designers DANIEL HUNTER AIA Hunter architecture ltd.
Backyard remodeling doesn’t have to break the bank. Your dream pool was expensive enough without factoring in a beautiful backyard to match. Ditch high-priced custom design concepts; as long as you know the ambiance you wish to cultivate, it’s easier than ever to design yourself. Roll up your sleeves, get the paint ready, and make those patio and pool remodeling ideas come to life in a few easy steps. First, determine your total budget and the “must-have” items for your yard. For example, if a pool will serve as a key focal point, decide how much you’re willing to spend on one and decorate around it, using the piece as your primary source of inspiration. For a vast, relatively empty yard, consider sectionalizing it based on anticipated activities such as lounging, kids’ play, cooking, and entertaining. Areas can be separated with IKEA curtains, potted plants, or pavers. Thrift stores can be hit-or-miss, but once you start making the rounds, you’ll understand what shops have the best selections and when they rotate stock. Online buy-and-sell websites like Craigslist and Oodle are great places to score a vintage table or used chair worthy of a refinish. Even if you don’t have a pickup truck for hauling, consider renting one from a moving company (better yet—borrow one). You’re still likely to pay far less than retail prices even with additional rental costs. Skip an expensive landscaping consultation and research low-maintenance plants native to your region. Next, find those plants at a local, independent florist or garden center. You may even find they have a Groupon deal to attract new business. Pool by Homer Glen Pools & Spas Aqua Pools, Inc. Paint old terracotta pots bright colors to liven up a lounge area. Spray paint thrift store lanterns for a shabby chic look or sand down an old coffee table and stain it white. Rather than pay for expensive outdoor tile work, use large square concrete slabs to create your own pathway or designated grilling area. Construct a DIY fireplace for under $100 in one weekend by following the online tutorial that best fits your theme. Ask around local stores for leftover wooden pallets and create your own mini bar. Drape lights through the holes at night for a twinkling cocktail party. Rather than toil over dead grass and dirt patches with sod installation, lay decomposed granite (DG) or artificial turf. Similarly, plant a few flower beds or an herb garden rather than lining the entire perimeter with costly plants that require weekly upkeep. Carve out a walkway lined with smooth rocks for a polished look that’s as pretty as it is functional. Search the classifieds for an antique trellis and give it new life in the garden. 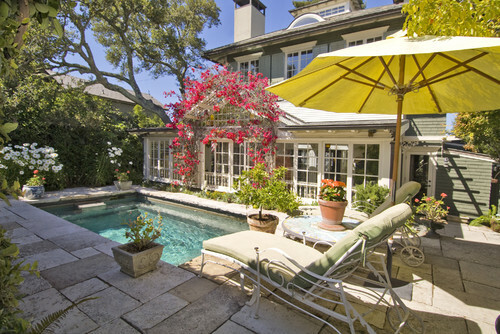 Paint it or plant vines on either side to serve as your poolside focal point. Make your own hammock to lounge in after a dip in the pool. Anchor it to two trees or have it stand alone as a reading nook. A backyard makeover can be truly awe-inspiring as long as you approach it with a clear vision and adequate budget. Don’t feel as if it needs to be done in one weekend either. Adding new elements to your yard over time will ensure you stay on course financially and avoid feeling overwhelmed. Enlist the help of a crafty friend who will enjoy the end result as much as you will. With a beautiful pool and plenty of extra space, there’s no reason your outdoor oasis shouldn’t be as remarkable as the inside of your home.